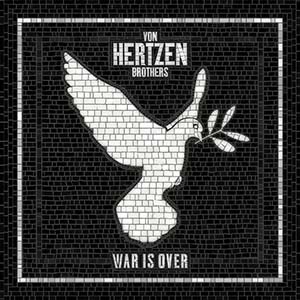 Award winning cinematic Finnish rockers Von Hertzen Brothers are thrilled to announce the release of their brand new studio album War Is Over which will be out on 3rd November 2017. The chart topping band have had three #1 albums (Stars Aligned, New Day Rising, Love Remains the Same) and another two Top Five albums (Nine Lives, Approach) in their homeland. This has led to them scooping an Emma Award (The Finnish Grammy) and a Progressive Music ‘Anthem of the Year’ Award as well as nominations and plaudits along the way due to their ability to blend complex arrangements, expansive musical landscapes and surging tension all entwined with gloriously uplifting melodies. It is these sonic explorations that has seen them blaze a trail across Europe since 2000, leading them to play with artists from Foo Fighters, 30 Seconds to Mars, Neil Young, Biffy Clyro, The Wildhearts and ZZ Top to Anathema and Opeth. While seeking to build on the bands long standing domestic success the band have looked to assemble a new team around them globally to help them replicate this internationally with the recent appointments of both new management & booking agents while also most recently signing a new worldwide deal with Mascot Label Group. Mikko wrote most of his lyrics whilst on a one month break in India during January 2017, this following his long association with the country. He spent seven years living in an Ashram with the spiritual guru and leader Amma, also known as ‘The Hugging Saint’ as well as studying music there - one of the songs on the album To The End of the World brings in these influences and uses Indian music scales. The album was produced by all three brothers between Helsinki and Porvoo, each ones produced their ‘own’ songs; Mikko on To The End of the World, The Arsonist, Frozen Butterflies and Beyond Horizon. Jonne for Blindsight and Kie on War Is Over, Who Are You?, Long Lost Sailor, Wanderlust and Jerusalem – which also features Janne ‘Burton’ Puurtinrn of Finnish rockser s HIM on keys. For the new and fresh War is Over horizon the band drafted in and old friend and welcomed back drummer Sami Kuoppamäki; one of Finlands finest drummers, who played on the 2006 Emma Award winning Approach album as well as for Apocalyptica, Stratovarius and acclaimed Finnish cult band Kingston Wall. He adds. “Now when the album is ready, we couldn’t be more excited about people getting to hear it and taking the new songs to the stages. We are also pleased to announce that Sami and our Swedish friend and amazing keyboard player, Robert Engstrand, will be joining us for both of our upcoming tours.” Robert is best known for his work with Turisas and the Swedish band The Flower Kings. “Knowing that we had Sami involved also helped us make our decision as to who was best to engineer the album. We all really wanted someone fresh in the studio who was great at both recording and capturing Sami’s drum performances. We approached engineer/mixing engineer Tommi Vainikainen who had previously recorded and mixed a live studio recording with us in 2011. We were all really impressed with his work then, so he seemed like the right person to bring in to the team. Once the recording process got underway, we knew we had all the ingredients and know-how to make the best album possible.” Mikko explains. Reflecting the nature and tone of the record, the art work soon followed. A cover was needed to be as plain and simple as possible. “We wanted a Dove of peace” Kie adds. “Our own Dove of peace, a VHB Dove of peace.” So they enlisted the help of Tero Ahonen, an enthusiastic graphic designer and photographer from Helsinki to take over the concept who came up with the mosaic idea and spent a week painstakingly putting together the mosaic design piece by piece to create the wonderful cover.